Jupiter, the fifth planet from the Sun, is the largest and most massive planet in our solar system. It is 1,300 times larger than Earth, with more than 300 times the mass of Earth and 2.5 times the mass of all the other planets combined. It has a diameter over 88,000 miles (142,000 kilometers), more than eleven times Earth's diameter of 7,900 miles (12,700 kilometers). Lying about 480 million miles (770 million kilometers) from the Sun, Jupiter takes almost 12 years to complete one revolution. orbit counter-clockwise. Astronomers speculate that Jupiter, while it was still young, captured the newly discovered moons from a group of small icy and rocky objects that orbit the Sun. Jupiter is often the brightest object in the sky after the Sun and Venus. For some unknown reasons, it reflects light that is twice as intense as the sunlight that strikes it. Dr. Joseph Burns, astronomy professor at Cornell University, and a team of researchers figured out how Jupiter's rings are formed. After studying photos taken by the unmanned spacecraft Galileo, astronomers announced that Jupiter's rings are formed when cosmic debris (such as asteroids or particles of comets) are pulled and smashed into Jupiter's moons by the planet's powerful magnetic field. The resulting collision produces dust clouds that become the rings around the planet. Through a telescope, Jupiter appears as a globe of colorful swirling bands. These bands may be a result of the planet's fast rotation. One day on Jupiter lasts only 10 hours (compared to a rotational period of 24 hours on Earth). 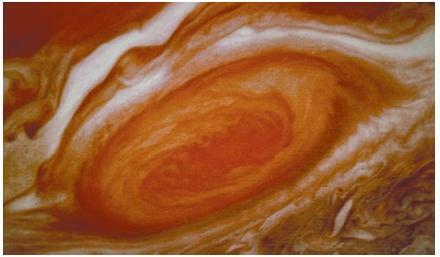 Jupiter's most outstanding feature is its Great Red Spot. The spot is actually a swirling, windy storm measuring 16,000 miles (25,700 kilometers) long and 8,700 miles (14,000 kilometers) wide, an area large enough to cover two Earths. The spot may get its red color from sulfur or phosphorus, but no one is sure. Beneath it lie three white oval areas. Each is a storm about the size of Mars. One theory about Jupiter's origin is that the planet is made of the original gas and dust that came together to form the Sun and planets. Since it so far from the Sun, its components may have undergone little or no change. A more recent theory, however, states that Jupiter was formed from ice and rock from comets, and that it grew by attracting other matter around it. 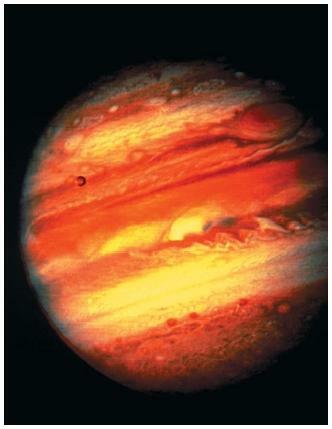 Astronomers have been observing Jupiter since the beginning of recorded time. In 1610, Italian astronomer Galileo Galilei (1564–1642) looked through his recently developed telescope and discovered the planet's four largest moons: Io, Europa, Ganymede, and Callisto. In 1989, the 2.5-ton (2.3-metric ton) Galileo space probe was launched aboard the space shuttle Atlantis. On December 7, 1995, Galileo began orbiting Jupiter and dropped a mini-probe the size of an average backyard barbecue grill. The probe entered Jupiter's atmosphere at a speed of 106,000 miles (170,500 kilometers) per hour. Soon after, the probe released a parachute and floated down to the planet's hot surface. As it fell, intense winds blew it 300 miles (480 kilometers) horizontally. The probe spent 58 minutes taking extremely detailed pictures of Jupiter until its cameras stopped working at an altitude of about 100 miles (160 kilometers) below the top of the planet's cloud cover. Eight hours later, the probe was completely vaporized as temperatures reached 3,400°F (1,870°C). What the probe discovered first was a belt of radiation 31,000 miles (49,900 kilometers) above Jupiter's clouds, containing the strongest radio waves in the solar system. It next encountered Jupiter's swirling clouds and found that they contain water, helium, hydrogen, carbon, sulfur, and neon, but in much smaller quantities than expected. It also found gaseous krypton and xenon, but in greater amounts than previously estimated. Scientists had predicted the probe would encounter three or four dense cloud layers of ammonia, hydrogen, sulfide, and water, but instead it found only thin, hazy clouds. The probe detected only faint signs of lightning at least 600 miles (965 kilometers) away, far less than expected. It also discovered that lightning on Jupiter occurs only one-tenth as often as it does on Earth. Perhaps the biggest surprise uncovered by the probe was the lack of water on the planet. at Earth's surface. Scientists believe a layer of compressed hydrogen surrounds the core. Hydrogen in this layer may act like a metal and may be the cause of Jupiter's intense magnetic field (five times greater than the Sun's). At the beginning of 2001, Galileo was still making valuable scientific observations about the planet and its moons, more than three years after its original two-year mission in orbit around Jupiter. The craft had already received three times the cumulative radiation exposure it was designed to withstand. In early 1993, Eugene Shoemaker (1928–1997), Carolyn Shoemaker (1948– ), and David Levy discovered a comet moving across the night sky. They were surprised at its appearance, since it seemed elongated compared to other comets they had seen. Further observations showed that the comet consisted of a large number of fragments, apparently torn apart during a close encounter with Jupiter during a previous orbit. Calculations showed that this "string of pearls" would collide with Jupiter in July 1994. A global effort was mounted to observe the impacts with nearly all ground-based and space-based telescopes available. Although astronomers could not predict what effect the collisions would have on Jupiter, or even whether they would be visible, the results turned out to be spectacular. Observatories around the world and satellite telescopes such as the Hubble Space Telescope observed the impacts and their effects. Galileo, en route to Jupiter at the time, provided astronomers with a frontrow seat of the event. Even relatively small amateur telescopes were able to see some of the larger impact sites. Dark regions were visible in the atmosphere for months. The data collected from the impact event will help scientists to understand the atmosphere of Jupiter, since the collisions dredged up material from parts of the atmosphere that are normally hidden. The wealth of information provided by Galileo, added to the Shoemaker-Levy impact data, is giving astronomers their best understanding yet of the biggest planet in our solar system. 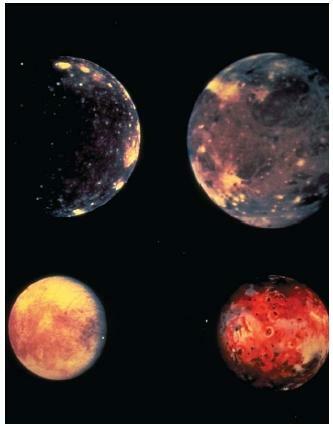 this was so cool i wuldnt change a thing well im 12 and didnt know about the 28 moons. everything is just fine. Jupiter is beautiful among other planets. Misterious but amazing beyond words. It lets you know there is a God because man could never create space. Wow I love my science channel it teaches us alot about space! Could I have a list of the contributing authors for this piece please?